Awesome open water Highlander sailing on Lake Erie. 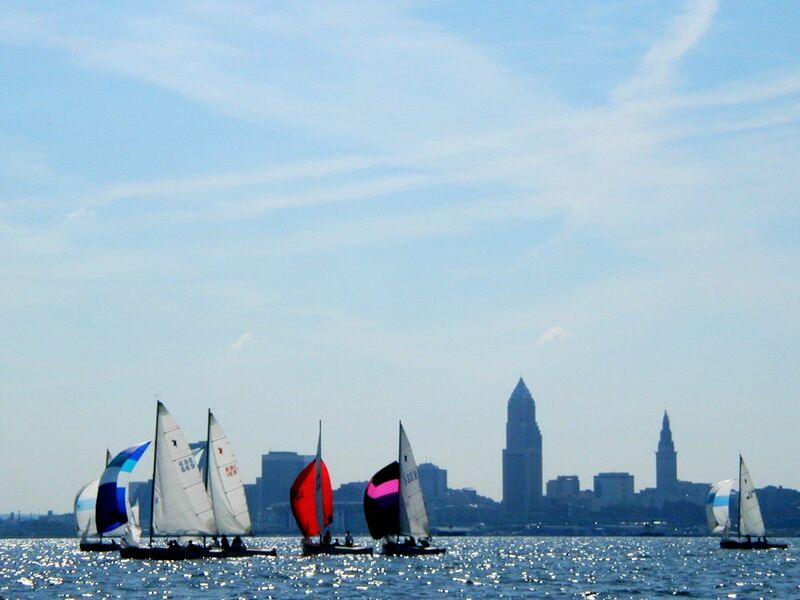 Highlander Fleet 14, founded in 1958, is based out of Edgewater Yacht Club and Whiskey Island Marina in Downtown Cleveland. The Highlander was displayed at the first Cleveland Boat Show held in 1958. Fleet 14 is one of the oldest racing fleets still racing on Lake Erie. Club racing is every Wednesday evening and Sunday mornings from Memorial Day weekend through September. Steve Merriam is the co-fleet captain out of Edgewater Yacht Club and Gary Vinicky is the co-fleet captain out of Whiskey Island. Sailing a Highlander is a wonderful outdoor adventure for young and old. It is exciting, challenging, fun and comparatively inexpensive. It is a sport that brings together people of all ages and all walks of life with a common interest and provides an opportunity to build lifelong friendships. If you ever thought you might be interested in sailing and becoming a member of a sailing club, Highlander Fleet 14 would like to invite you, your family and friends to come sail with us. Fleet14 is a great support group willing to share ideas - no secrets. Racing the Highlander is highly recommended. In the racing environment, your boat handling skills leaving the dock, out in open water and returning to the dock will improve exponentially compared to cruising around by yourself. Fleet 14 is a marvelous support group that hangs around after each race discussing what occurred out on the water in an atmosphere of camaraderie. Also, a racing environment offers safety in numbers. We should be up to 25 boats in 2011.